Tell me if you’ve heard this scenario before. The Knicks play solid in the first and second quarter. They pass the ball, look for the open man, and play active and smart on defense. They begin to unravel in the third quarter and finally fall apart in the fourth quarter as lack of defensive stops discourages them. Of course you’ve heard this before since it’s been the Knicks’ M.O on their now on five-game losing streak. The Washington Wizards, a playoff team but no powerhouse, had an easy time of it once they figured out the Knicks currently have no heart or identity on offense or defense. STILL WAITING FOR THAT FULL GAME: 12 games in, the Knicks have yet to put together a full 48 minutes of competent basketball. The first half last night saw Wizards point guard John Wall run amuck in the first quarter and early part of the second by scoring 17 points. His output was offset by a re-energized Amar’e Stoudemire, who was thriving in the post-up and pick n’ rolls (5-5, 12 points). Carmelo Anthony stayed under control in the first half as well with his shot selection, helping the Knicks to 52-49 halftime lead. As usual, things fell apart in the third quarter. The offense sputtered into isolation plays for JR Smith (6-14, 12 points) and Melo, leading to long missed jumpers and the Wizards pouncing on the Knicks’ weak transition defense. 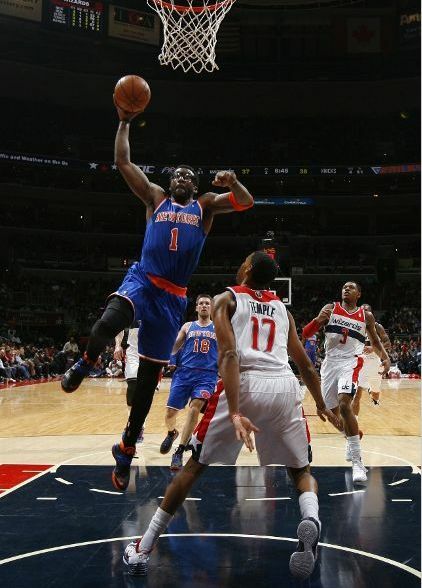 The Wizards outscored the Knicks 27-17 to take a 76-69 lead into the fourth. While the Knicks, specificaly Melo, JR and Pablo Prigioni hit some timely threes in the fourth to remain close, they could never get any stops. Guards like Bradley Beal (18 points) and the aforementioned Wall (31 points) abused them with pick n’ rolls and penetration to score at will and prevent a Knicks comeback. The team appeared to sense their defense couldn’t hold firm. Mentally, you began to see them start slacking by the middle of the quarter. The biggest culprit was Melo, who several times failed to rotate and allowed the Wizards to sink open threes. MELO’S GOOD AND BAD: Anthony notched another double double (23 points, 12 rebounds) and shot 47% from the field, so on the surface you’d think he’s one of the last people you’d criticize. But in this game he deserves a fair share of the blame, as he didn’t provide full effort on defense in the crucial fourth quarter. I’m sure he’s exasperated by the big weight he’s had to carry so early in the season, but the team will always take its lead from him. When Melo starts to check out, the team follows. He’s shown flashes of good passing and that’s the only way the team will regain its confidence. Two assists for him won’t suffice and neither will repeated isolation plays in crunch time. Melo was great with the “hockey assists” in a few games already this year and needs to continue that to keep Bargnani’s offense involved late in the game. BACKCOURT WOES: Raymond Felton sat for his third straight game with back issues, leading to another start for Beno Udrih. Coming off his stellar effort against the Pacers, some fans were speculating that Udrih might be the starting answer for Felton. This game brought those views back to reality, as Udrih also struggled mightily to keep the young Wizards guards in front of him. And offensively, he wasn’t much better, mustering just 2 points and 5 assists. Iman Shumpert was mostly invisible as well, delivering 6 points, 3 steals and 1 rebound in 27 minutes. THE ROADTRIP OF WOODY’S FUTURE: The Knicks now face a three-game road trip starting tomorrow night in Portland before moving on to Los Angeles (Clippers) and Denver. Should the Knicks not win a game, which is very possible if the team continues playing like this, then it’s hard to imagine Mike Woodson making through the end of the week. The Knicks will at that point have a 3-12 record while being on a 8-game losing streak. If the team comes out with no urgency in Portland, it sends a clear message about the team’s pride (or lack thereof).